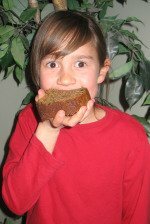 This zucchini bread recipe is one of our family's favorite treats. Mix together all the ingredients before mixing in the flour. After mixing in the flour, pour the batter into two greased loaf pans. Or you can use wax paper to keep the bread from sticking to the bottom of the pan. Check the bread to see if it's done by sticking a knife in the center of one of one the loaves. If it comes out clean (without dough sticking to the knife), the bread is ready to take out of the oven. Grate your zucchini during the summer and freeze 2-3 cups of it in a quart size freezer bags. 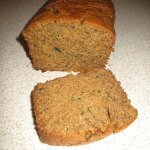 This way you can make zucchini bread all winter.